Figure 6.27 Stratigraphic ranges of fossil pollen species and groups in the Hell Creek Formation and Tullock Member of the Fort Union Formation at two localities in eastern Montana (modified from Tschudy 1970). Reprinted by permission. stratigraphic section. As coarse as this analysis was, however, it clearly showed that there is a striking change in the palynoflora across the estimated position of the K-T boundary in the two measured sections (Figure 6.27). 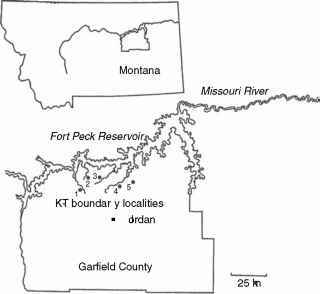 The K-T boundary was taken to be at the contact between the Hell Creek and Fort Union formations. This study demonstrated that the boundary could be identified palynologically by the disappearance of Cretaceous pollen species, which was a significant conclusion at the time. The studies by Smit and Van der Kaars (1984) and Smit et al. (1987) at Herpijunk Promontory (locality 34) established that palynological extinctions in the Hell Creek area are coincident with the K-T event as verified by the iridium anomaly. This locality also figures prominently in Hotton (2002). Hotton's (2002) publication in Geological Society of America Special Paper 361 supplies the most comprehensive data from the Hell Creek area of Montana. In her dissertation, on which the 2002 paper is based, Hotton distinguished 281 palynomorph species. She studied six localities in which the position of the K-T boundary is known from the iridium anomaly. Hotton named them Seven Blackfoot (locality 40), Billy Creek (locality 36), Herpijunk Northeast (locality 35), Iridium Hill (locality 38), Rick's Place (locality 37), and Lerbekmo (locality 39); see Figure 6.26. As mentioned, localities at or near Hotton's Seven Blackfoot and Herpijunk Northeast localities also figured in the studies by Tschudy (1970) and Smit and Van der Kaars (1984), respectively. Among Hotton's taxa, 15-30% disappeared 0-2 cm above the K-T boundary, and an additional 20-30% showed significant decline in abundance. Using statistical methods, Hotton found that species diversity is unchanged from the base of the Hell Creek Formation to about 3 m below the K-T boundary. In the interval 3-4 m below the boundary, diversity and abundance of "K species'' (those restricted to the Cretaceous; essentially the same group referred to as "K taxa'' by Nichols) declines somewhat, and the diversity of "T species'' (those restricted to the Paleocene) increases. Hotton interpreted this as a facies effect due to a rise in the water table within this interval. She attributed this decline or disappearance of30-40% of the palynoflora to the change in the depositional environment, which caused many plants that had been living in the area under conditions of lower water table to be reduced in number, or to disappear, as the water table rose. Hotton (2002) concluded that the disappearance of 15-30% of the K species was due to extinction of plants as a consequence of the impact event. Hotton (2002) recognized roughly three times the number of palynomorph taxa in eastern Montana as did Nichols (2002a) in adjacent western North Dakota because she described all forms she encountered, regardless of how rare many of them are, whereas Nichols focused on the most commonly occurring forms. Significantly, their estimates of extinction at the K-T boundary are closely comparable (Nichols, North Dakota, 17-30%; Hotton, Montana, 15-30%). Both Hotton and Nichols distinguished a facies effect on the palynofloral change across the boundary in the transition from the Hell Creek to the Fort Union formations. In eastern Montana, a relatively slight change in depositional environment was noted in the uppermost part of the Hell Creek Formation, but in western North Dakota, the change was so intense that an informal stratigraphic unit - the Fort Union Formation strata of Maastrichtian age - was recognized. The root cause of the facies effect appears to be the influence of depositional environment on palynomorph assemblages described by Kroeger (2002). Hotton statistically tested the occurrence of her K species in coal vs. clastic rocks and found that about 28% of the taxa were significantly less common in or entirely absent from coal. We point out that, although lithofacies somewhat influences the occurrence of fossil pollen and spores, it does not seriously compromise their utility as indicators of geologic age, especially when they are recorded on a presence-or-absence basis. In fact, almost 65% of Hotton's K species were statistically neutral with respect to coal. Neither Hotton (2002) nor Nichols and Johnson (2002) ascribed the disappearance of characteristic Cretaceous palynomorph species to facies change. These authors concluded that the coincidence of palynofloral extinction and physical evidence of extraterrestrial impact (the iridium abundance anomaly and shock-metamorphosed minerals in the boundary layer) are linked to a single causative event, the impact event originally hypothesized by Alvarez et al. (1980).